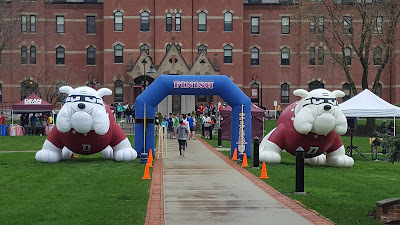 Dean College will host its 5th Annual Dean Dash 5K on Saturday, April 21, 2018 at the Franklin, MA campus. The course will start and finish at Awpie Way, directly outside of Dean Hall at the Dean College campus, 99 Main Street, Franklin, MA. The race will begin promptly at 1:00 p.m. for competitors to take a 3.2-mile walk, jog, or run through the residential streets of Franklin. A hydration station will be waiting for you at the 2-mile mark. Registration is $5 for Dean College students and kids 12 and under; $13 for faculty/staff/alumni; and $18 for family/community members. Registration prices will increase by $5 on race day. Price includes race t-shirt, race bib, drawstring bag souvenir, lunch, hydration station and live entertainment. Race day registration begins at 12:00 noon. Individuals who do not register ahead of time should be on location no later than 12:15 p.m. to complete the registration process. Whether you are a seasoned race enthusiast or a first-time runner, we hope you will join us by participating in this year's race. For more information and to register, visit www.dean.edu/deandash.